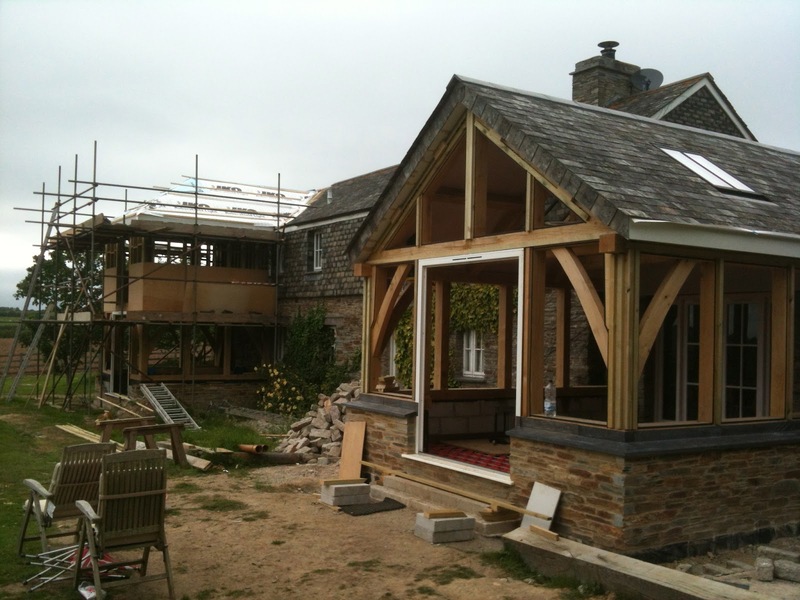 We've recently raised the Green Oak Timber Frames for a pair of extensions at this property on the Roseland, Cornwall...a single storey family room with a fully glazed gable, and a 2 storey frame with a little hipped roof in the bedroom (so engulfed by scaffolding I couldn't get a decent photo!) We're back on site this week installing the double glazed units and dry oak coverstrip that holds them in place. Again, this project came from the drawing board of architect Mark Datson; our list of collaborative projects now nearing double figures. It's the first time I've worked with St. Mawes builder Martin Day, and he's been excellent at co-ordinating the works and making the oak frames tie in to the existing house so tidily.